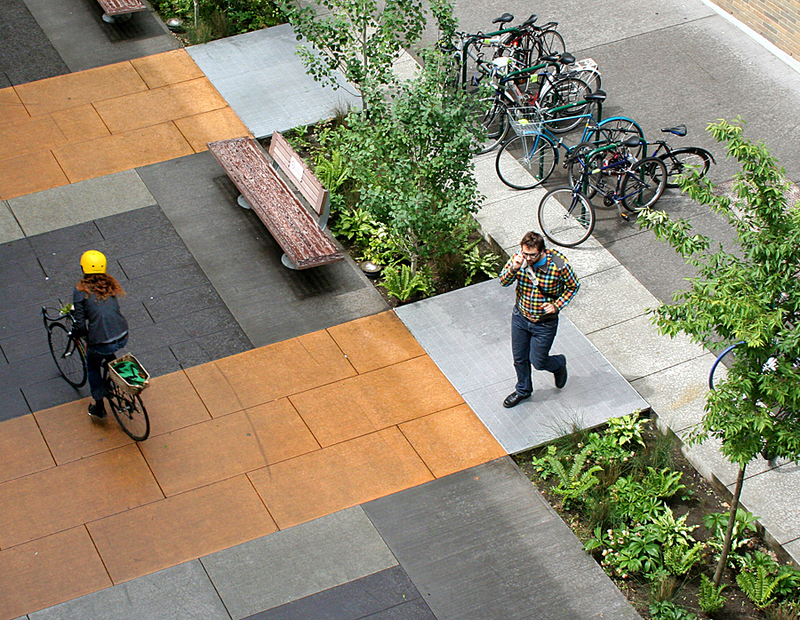 At the time it was completed in 2009, the SW Montgomery Green Street Plan was regarded as Portland, Oregon’s most innovative green street planning effort. 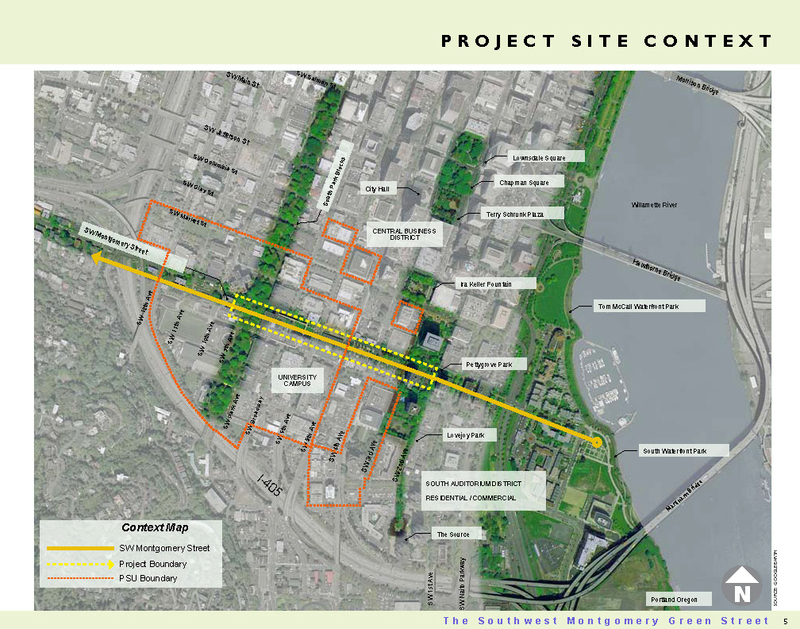 This multi-block plan showcases a variety of green infrastructure and alternative transportation strategies along a corridor that passes through Portland State University (PSU) and into the emerging neighborhood along SW Montgomery Street. The project is a culmination of four decades of planning by the City of Portland, PSU, private developers and businesses. 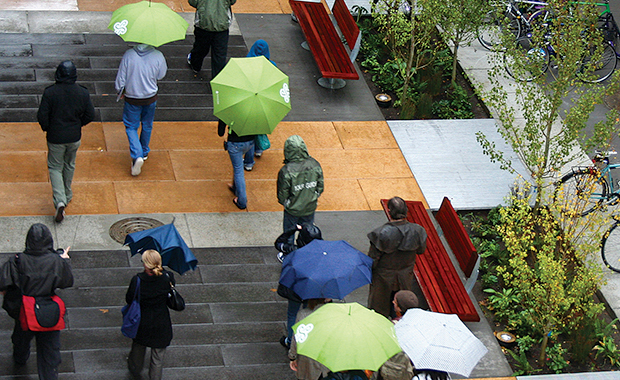 NNA Landscape Architecture was hired to help the project partners achieve multiple goals, including enhancing Portland’s current reputation as an incubator for innovative sustainable design and development. The green street’s signature feature, a 5-foot-wide “stormwater spine,” is designed to collect and treat 1.8 million gallons of stormwater runoff. Pedestrians cross low-profile metal grate bridges that allow the water to flow beneath. 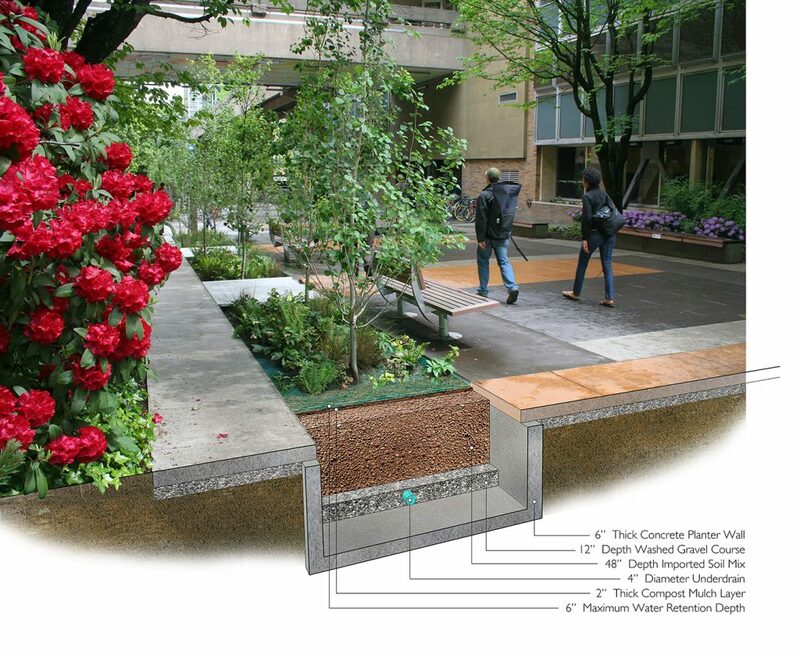 The design also includes stormwater swales, planters, green walls, green roofs, surface stormwater conveyance, creative downspout disconnection, pervious paving and other innovative strategies. 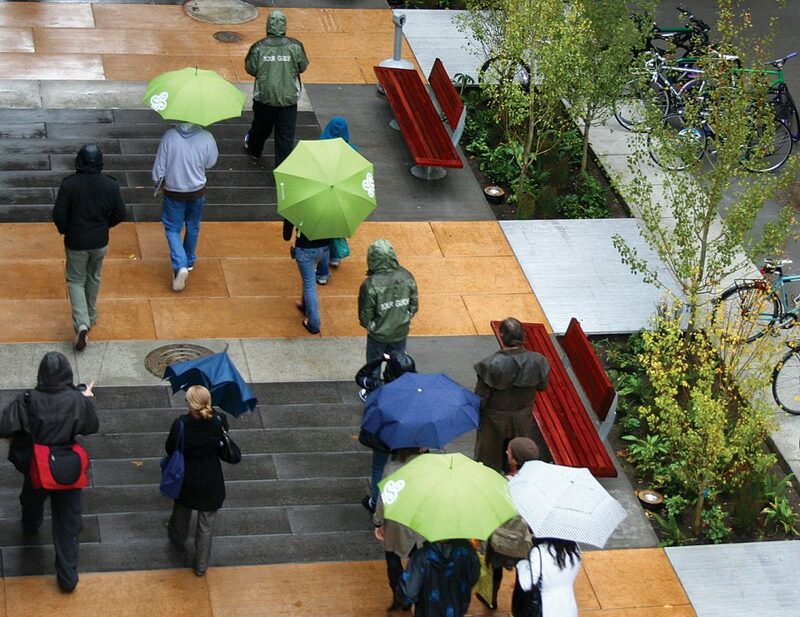 NNA Landscape Architecture received a 2012 ASLA Professional Honor Award for the project. Upon approval of the conceptual plans, construction began occurring in phases. 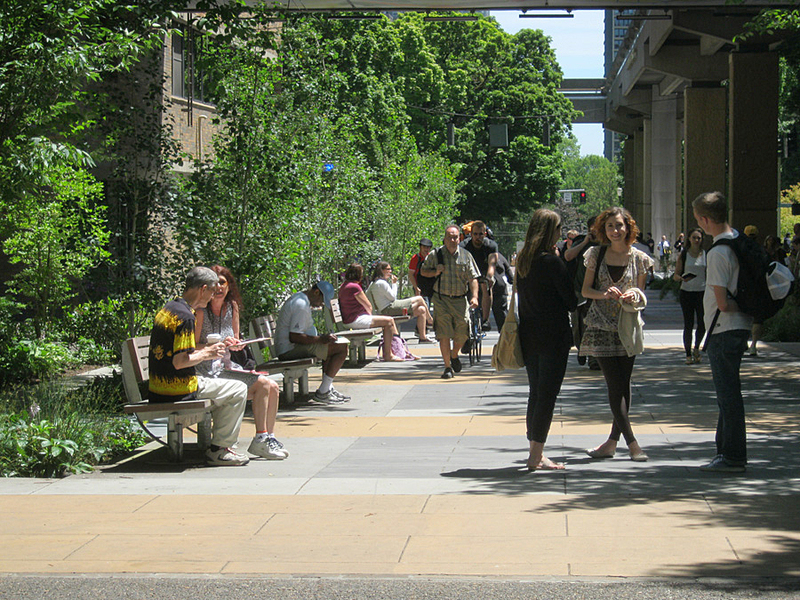 In 2009, NNA completed construction documentation for the build-out of three blocks, including Urban Center Plaza, Smith Memorial Student Union/Cramer Hall and PSU Science Center. 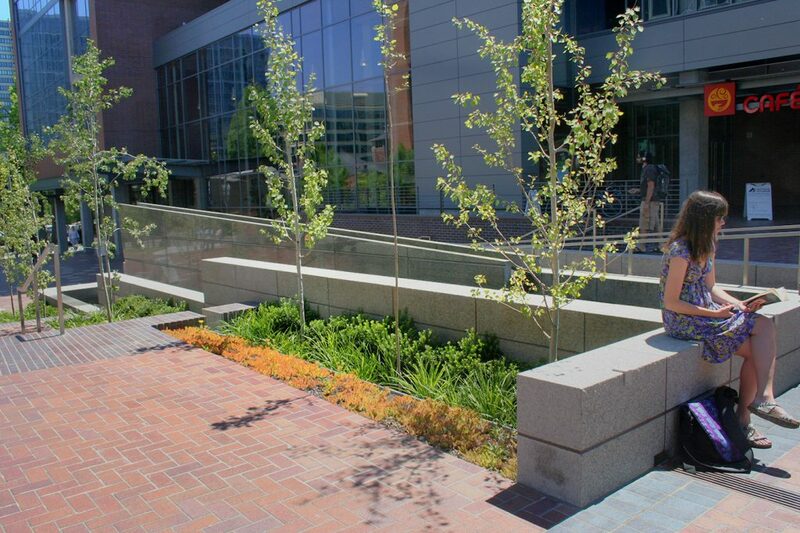 In addition to the 5-foot-wide “stormwater spine” that runs across the entire block, the re-graded Smith Memorial Student Union Plaza includes planters, which are fed by stormwater collected from the university’s north sky bridge that spans over Broadway. 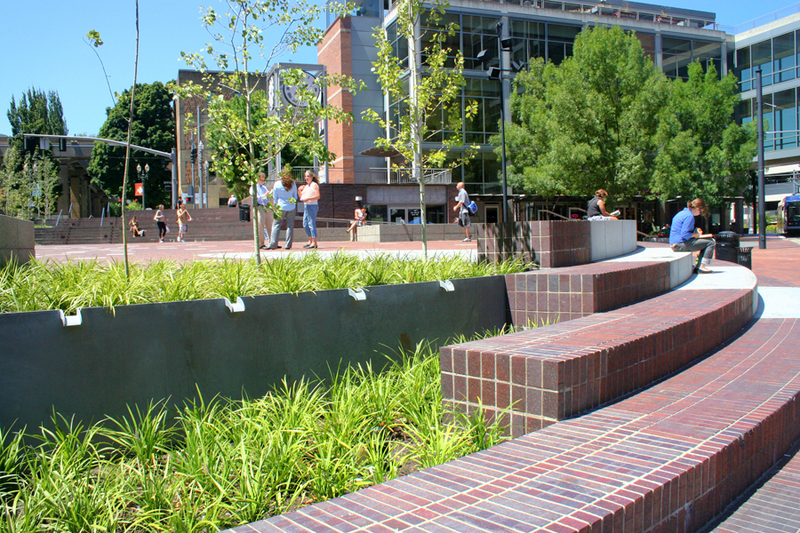 For PSU’s Urban Center Plaza, NNA worked with the university and other partners to create several design alternatives that maximized stormwater management while retaining the spirit, programming and design details of the original plaza. 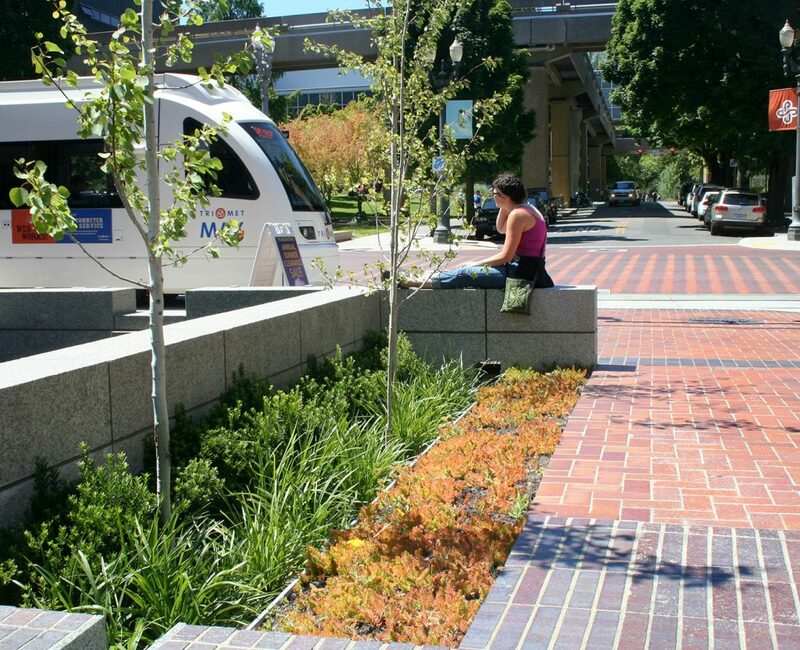 Like all other blocks along the SW Montgomery Green Street, the rebuilt plaza features a 5-foot-wide “stormwater spine" that collects and treats stormwater runoff. During the restoration of the plaza’s original fountains, we incorporated a series of metal and granite landscape planters to treat and filter stormwater. The modern stormwater facilities capture runoff from the 8,000-square-foot plaza and adjacent sidewalks, offering a beautiful reminder of the university’s commitment to green infrastructure.